Chicken is king in Ghana. They’re dodging cars in the street, being carried around in plastic bags or, most commonly, appearing next to a large side of rice. With the break neck development occurring in Accra, it was only a mater of time until the chicken migrated from the dusty street vendors to a more western fast food chain. 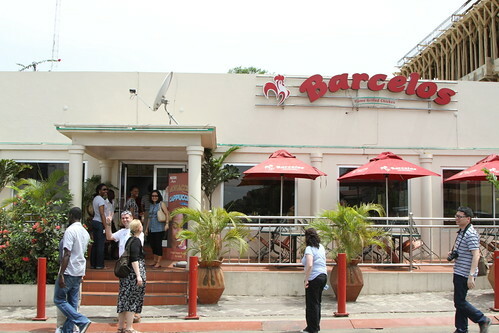 Barcelos is that chain. Service in Ghana is lethargic at the best of times. With a group of 12 people, ordering at any restaurant can be difficult. Barcelos is no exception, taking 20 minutes of queuing before the last person was placing their order. The food for the others was arriving well before then. 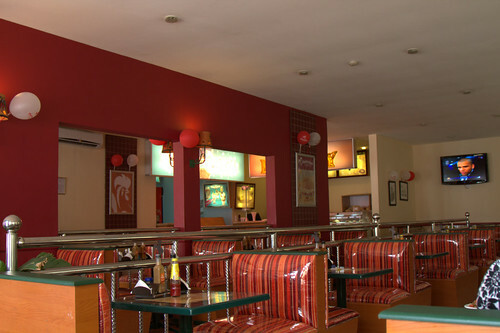 Once you’ve actually managed to order, the food is pretty good. All the ingredients taste fresh (maybe too fresh? ), and the chicken is very tender. 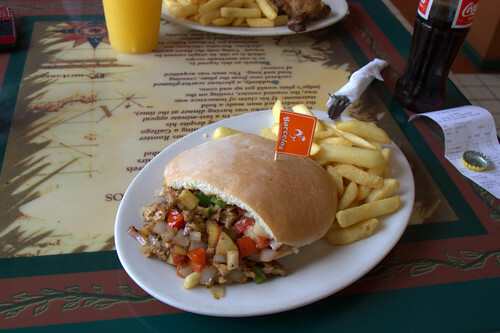 I ended up getting the Chicken Schwarma in Pita (10 Cedi, or $5.30 AUD), with a side of chips and a coke. The pita was surprisingly big, and I didn’t particularly mind the chicken pieces falling out the front. The chips were very average though, tasting a little old, and I was a little disappointed in the lack of dipping sauce options. 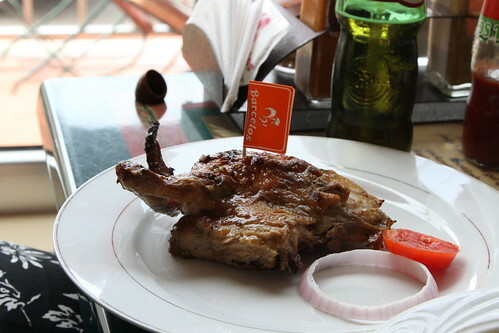 The 1/4 chicken (8.5 Cedi, or $4.5 AUD), ordered by a colleague, was very succulent. I’m not sure if they enjoyed it because it was good, or because it arrived in less than 40 minutes, which seems to be the standard in Accra. I don’t want to recommend a restaurant based solely on the speed at which food arrives, but speed is such an issue in Accra that I’m going to have to. This may not give you a great cultural experience, but it’s quick, easy and cheap. Did I mention quick? I must know: did you put that garnish there on the 1/4 chicken plate or is that how it’s served. At any rate keep up the good work, lookin’ forward to where you’re Ghana go next. Thanks Maki, I’ve definitely going to put up a few more reviews. We went out to a lovely Italian place last night, called Mamma Mia’s, but I haven’t been lugging my camera around with me during the week.